Congratulations! You’re officially #FACTORfunded. This resource section offers a comprehensive collection of resources to assist you as you enter the final stages of a FACTOR application. Whether you’re a first-time recipient, or a seasoned veteran, there’s a lot available to you to guide you through submitting your completion paperwork and ensuring you meet all of your funding obligations. 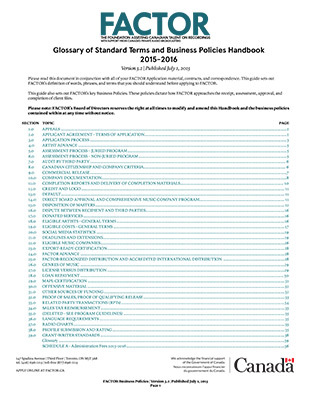 If you haven’t already familiarized yourself with our Business Policies, we strongly encourage you to do so, as this handbook sets out FACTOR’s definition of words, phrases and terms that you should know. Still feeling lost? Don’t panic. You can always contact us, or browse through our Recipient FAQ section to find answers to your questions. Congratulations on your FACTOR-funded project! 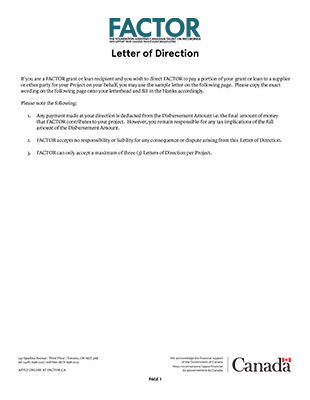 There are a number of important documents you should consult through the stages of completion. 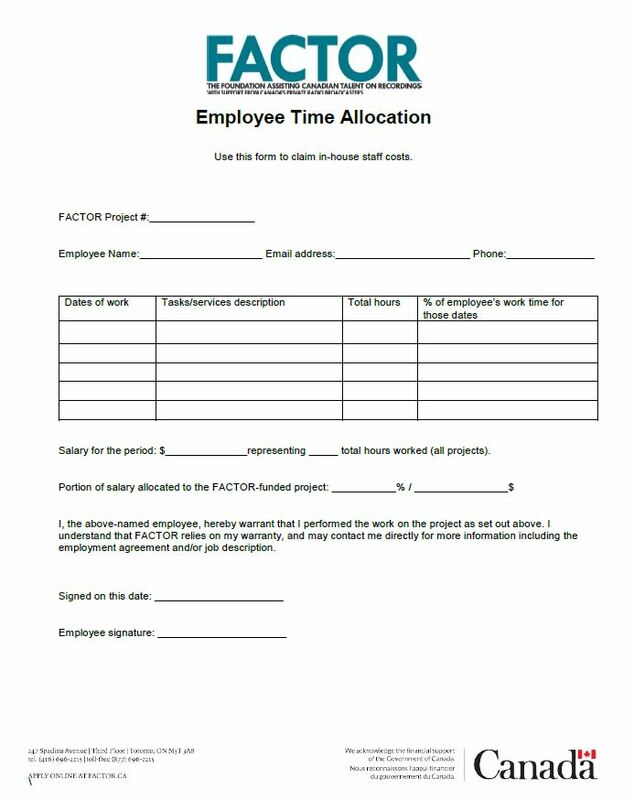 Your project coordinator may require one or more of these forms from you while you complete your project. Download FACTOR’s Standard Glossary of Terms & Business Policies here. A Completion guide for the Artist Development program. 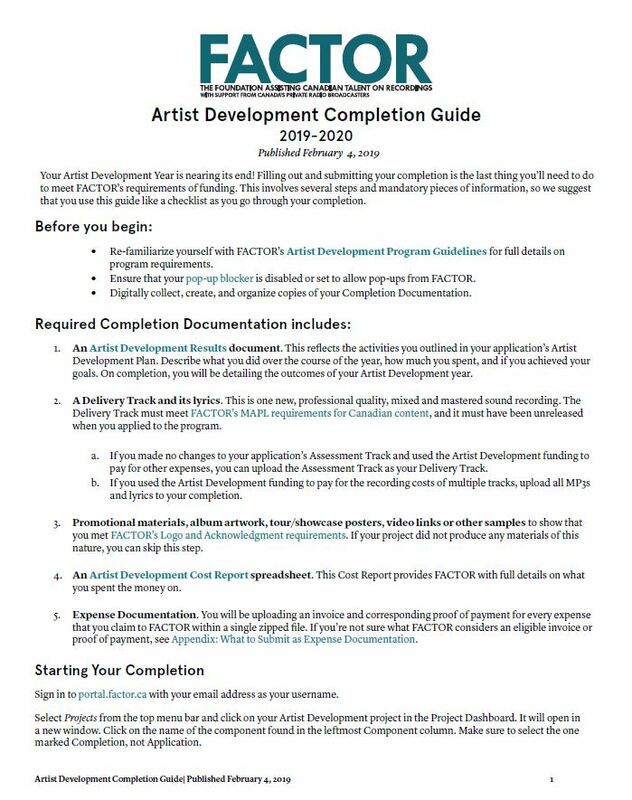 This form must be filled out to complete your Artist Development year and report on your results. 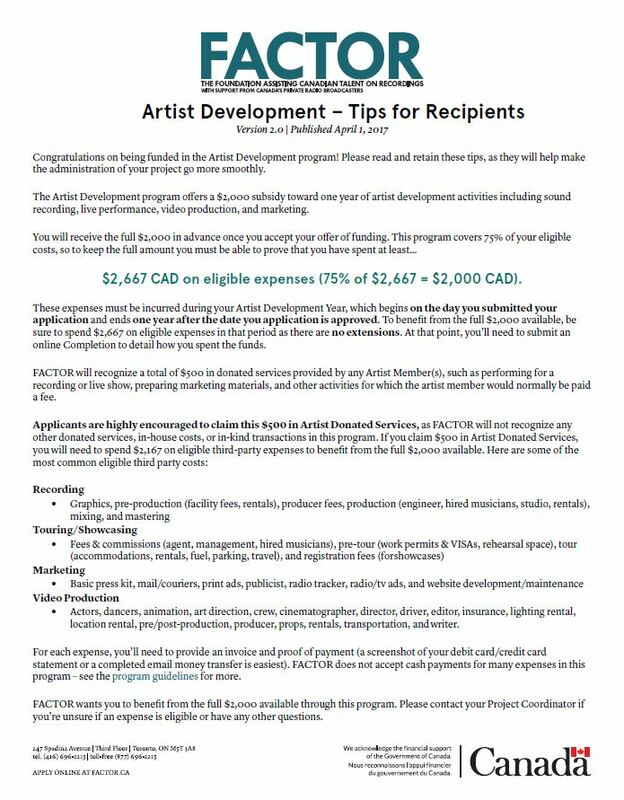 Tips for recipients of the Artist Development program. Mandatory Midterm Report template for Artist Development projects. 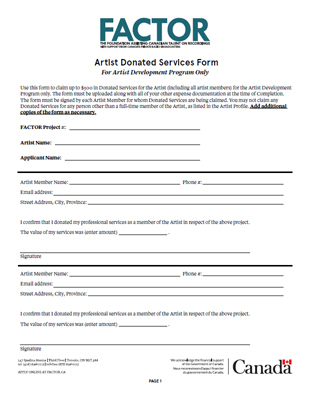 Used to claim artists’ donated services for Artist Development projects. 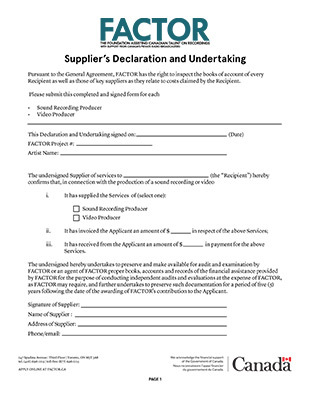 Mandatory document for your Business Development completion. Describes how to complete and submit a completion. 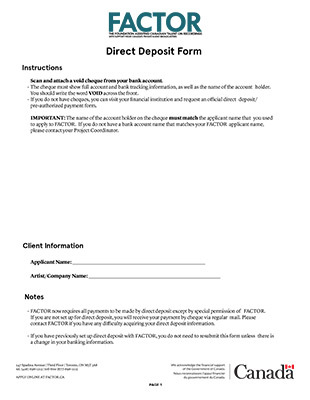 Used to set up direct deposit to receive funding from FACTOR. Form used to claim in-house staff costs. 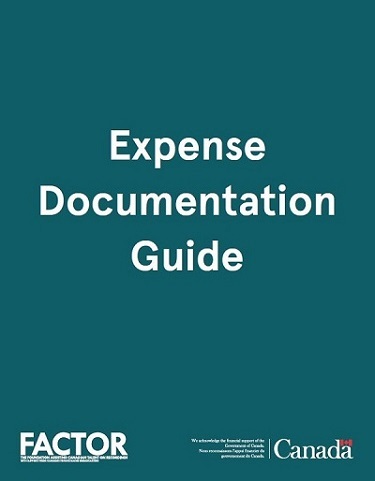 Details on what kind of expense documentation you must provide in your completion. 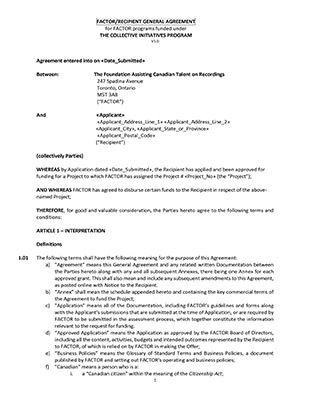 Directs FACTOR to issue payments to a third party on your behalf. 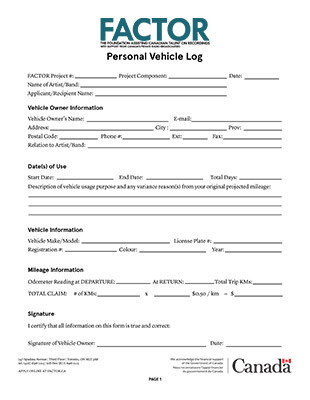 Used to claim personal vehicle expenses for eligible FACTOR projects. 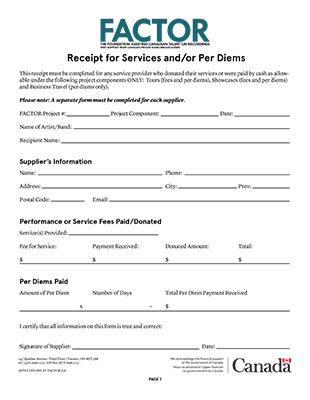 Where allowed, used to claim services and/or per diems paid in cash by or donated to the applicant. 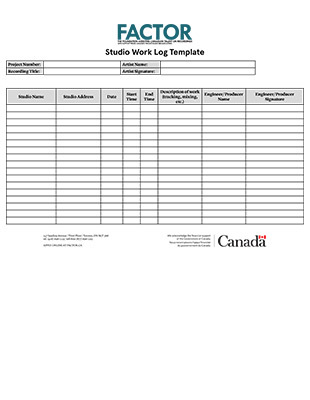 Template for log of in-studio work for submission with Sound Recording completion report. Used to declare the suppliers being used on a project. 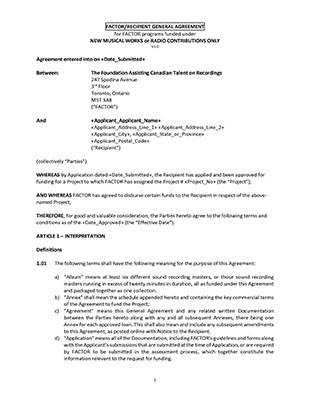 Depending on the Program under which you have received funding, there are different acknowledgment obligations as outlined in your General Agreement. All FACTOR-funded recipients must include appropriate logos and acknowledgments where applicable as a condition of funding. We’ve put together two comprehensive documents to help guide you, based on the program under which you were funded. If at any point in your project you’re unsure about where and how to put an acknowledgment credit, please speak to your project coordinator first. We recommend that you also consult the Department of Canadian Heritage’s Guide to Public Acknowledgement. Download the Logo & Acknowledgment Guide (all programs) here. Download the Logo & Acknowledgment – Sponsorship and Collective Initiatives Guide here. 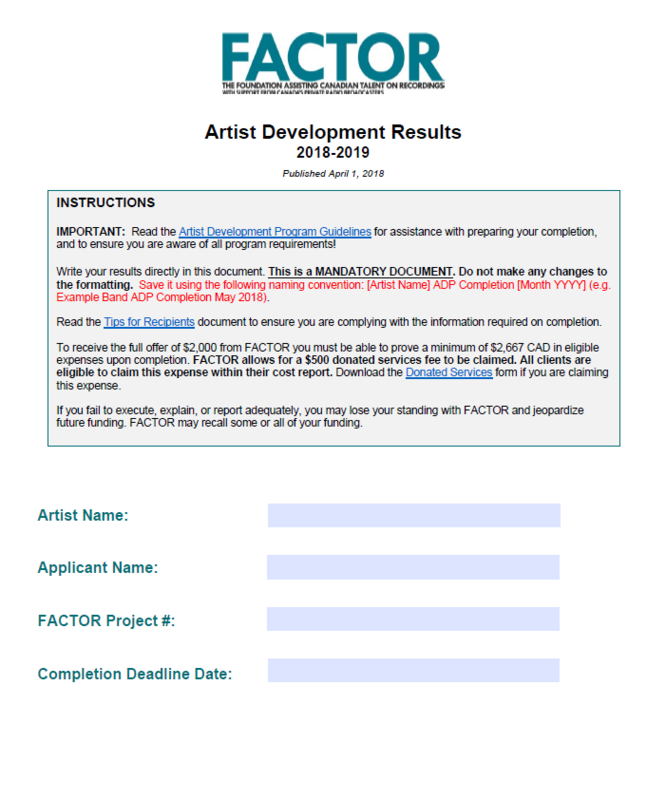 Download the FACTOR logo & Government of Canada wordmark for projects funded through New Musical Works, Collective Initiatives, or Sponsorship. Directs clients how to properly acknowledge funding support for new musical works projects. Directs clients how to properly acknowledge funding support for projects funded through Sponsorship & Collective Initiatives programs. 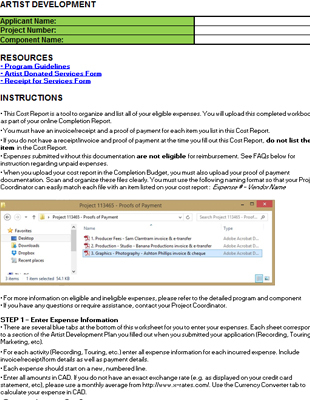 A Cost Report is a tool to organize and list all eligible expenses before submitting a completion budget. 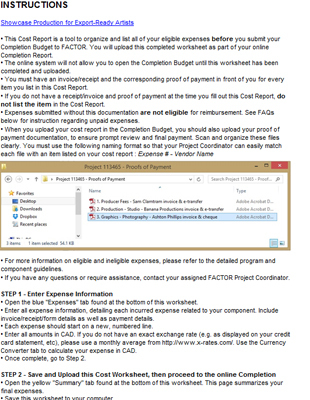 The completed Cost Report is uploaded to the completion budget page, located within the Budget tab of your completion. If you don’t have Microsoft Excel, you can fill out the cost report using free online software like Google Drive or Open Office. 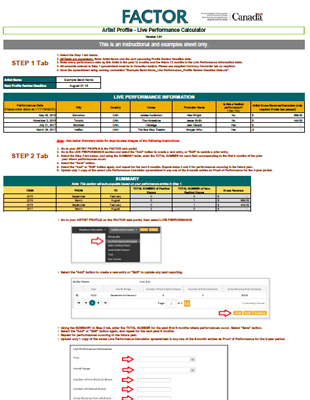 When you open the cost report, review the Instructions sheet for detailed directions. 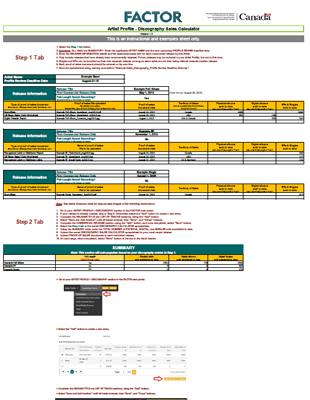 Cost Reports are also available for download in the Budget section of the Completion. 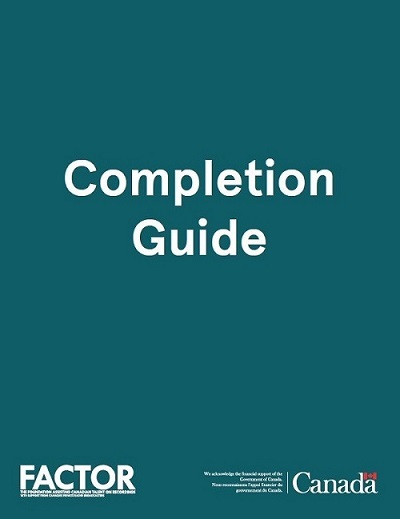 Download the Completion Guide here. 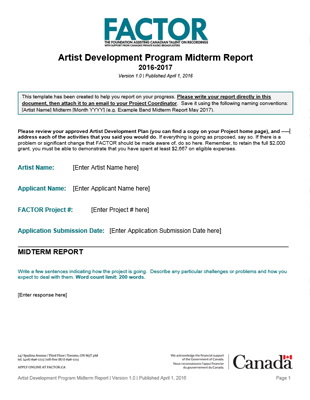 The Artist Development program Cost Report required as part of the completion report. 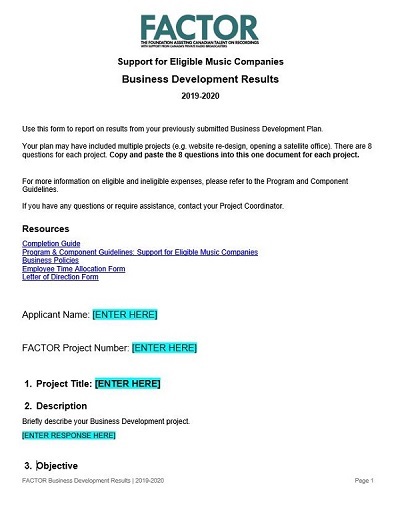 The Business Development program Cost Report required as part of the completion report. The Business Travel program Cost Report spreadsheet, required as part of FACTOR’s completion report. The Digital Marketing component Cost Report, required as part of FACTOR’s completion report. 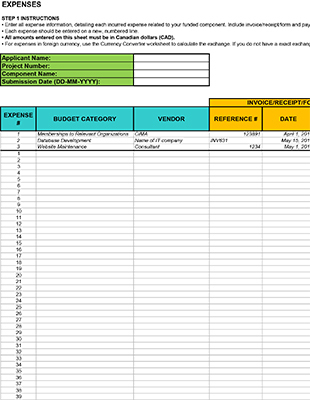 The Industry Events component Cost Report spreadsheet, required as part of FACTOR’s completion report to close a funded project. The Marketing component Cost Report spreadsheet, required as part of FACTOR’s completion report to close a funded project. The Radio Marketing component Cost Report spreadsheet, required as part of FACTOR’s completion report to close a funded project. The Showcase component Cost Report spreadsheet, required as part of FACTOR’s completion report to close a funded project. The Showcase Production for Export-Ready Artists Cost Report, required as part of FACTOR’s completion report. The Showcase Production for Artists from Official Language Minority Communities (OLMC) component Cost Report spreadsheet, required as part of FACTOR’s completion report to close a funded project. 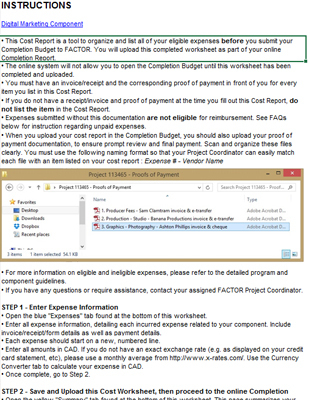 The Songwriters’ Workshop program Cost Report spreadsheet, required as part of FACTOR’s completion report to close a funded project. 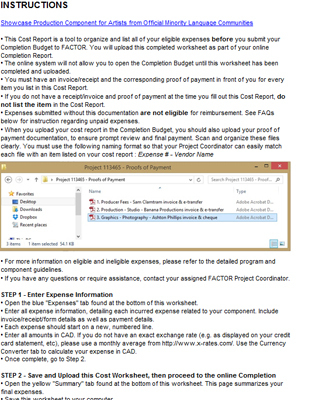 The Sound Recording component Cost Report spreadsheet, required as part of FACTOR’s completion report to close a funded project. The Tour Support component Cost Report spreadsheet, required as part of FACTOR’s completion report to close a funded project. The Video component Cost Report spreadsheet, required as part of FACTOR’s completion report to close a funded project.